The bass player pulled of rock pose after rock pose. Shooter plays a mean guitar. Its a custom beast with a nod to the South. 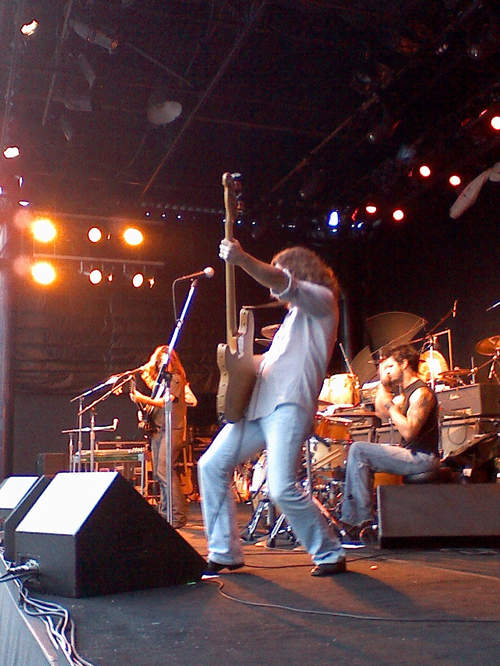 Shooter Jennings and his band rock in the grand old Southern Rock style and if you get a chance to see them, GO!! It's a lot of fun. Now it was time for Dickey. This was a guitar heavy show. and the back line of Marshal amps let you know, these guys are serious. After a couple of tunes, Dickey mention to the audience that he was going to play a couple of his tunes and a couple of classics, but nothing by the Allman Brothers. The Allman Brothers was formed in 1969, and consisted of Duane Allman (slide guitar and lead guitar), Gregg Allman (vocals, organ), Dickey Betts (lead guitar, vocals), Berry Oakley (bass guitar), Butch Trucks (drums) and Jai Johanny "Jaimoe" Johanson (drums). 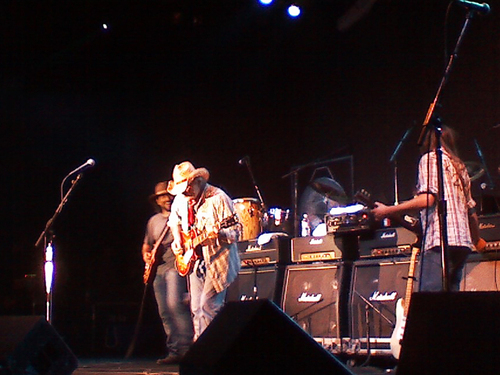 The Allman Brothers are considered the start of the southern rock band. 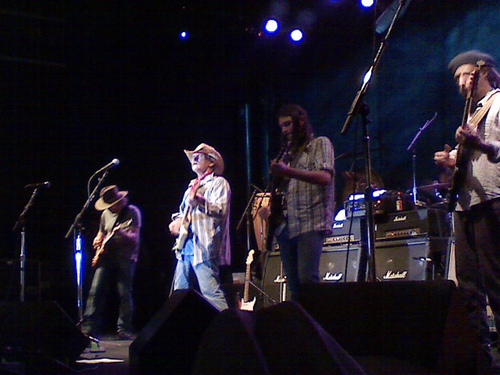 After a long and difficult path, the Allmans disbanded and reformed and disbanded and reformed, but in 2000, the band forced Dickey Betts out for "personal and professional reasons." 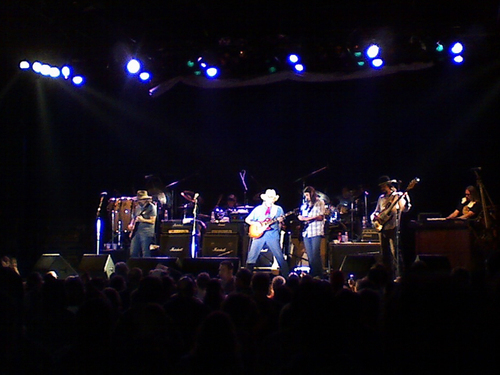 For that tour, he was replaced by Jimmy Herring. 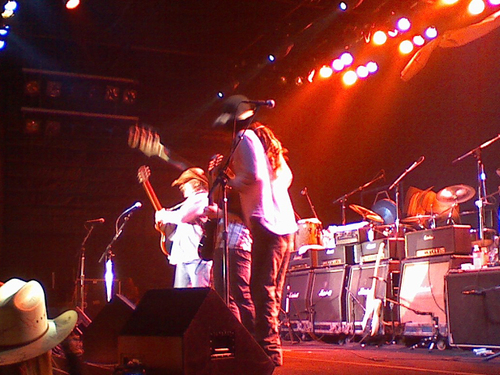 (Jimmy now plays for Widespread Panic) So there is no love lost between the current version of the Allmans and Dickey. 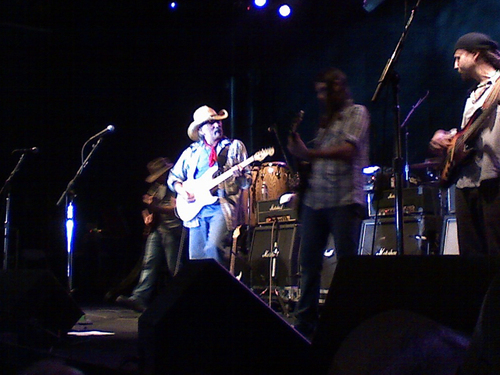 That did not stop him from playing classic songs that the Allmans made famous but that Dickey Betts wrote, for example a great version of Ramblin' Man. 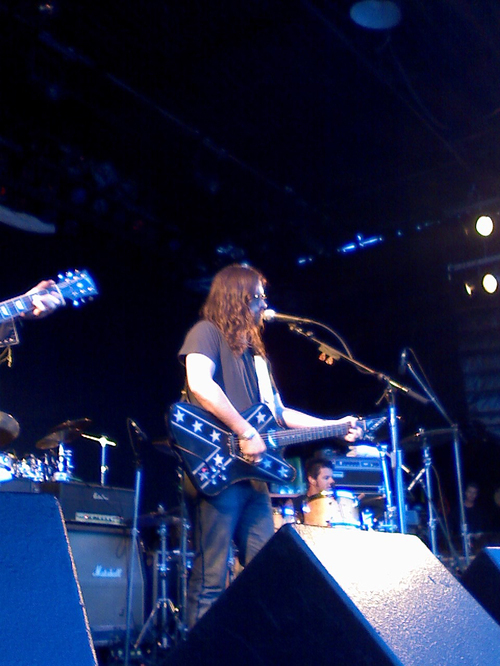 He also brought Shooter Jennings out for a spirited duet that really showed how these guys can have some fun on stage. Good shots Alan....I agree,looks like that bass player from SJ was getting off. I am enjoying all the different band pics that you're covering. Keep on keeping on! Great shots Alan. Made me wish I was there! Alan...i can't believe that a phone could take such great pictures!!!!!!!!!!!!!!!!! Way to go Alan... great shot! It just goes to show ... your the best photographer in the contest. What a great story and pictures! I have wanted to see Shooter for quite some time now and have never seen any live shots like that before. Thanks! Great to see such amazing pictures come from a camera phone........may have to look into getting one one day, though I imagine it is not the tool, but the artist using the tool that captures such amazing images. WOW what a week for you ~ Dickey, CC AND RD!?! Great story and shots, It's crazy that those are taken by cell.